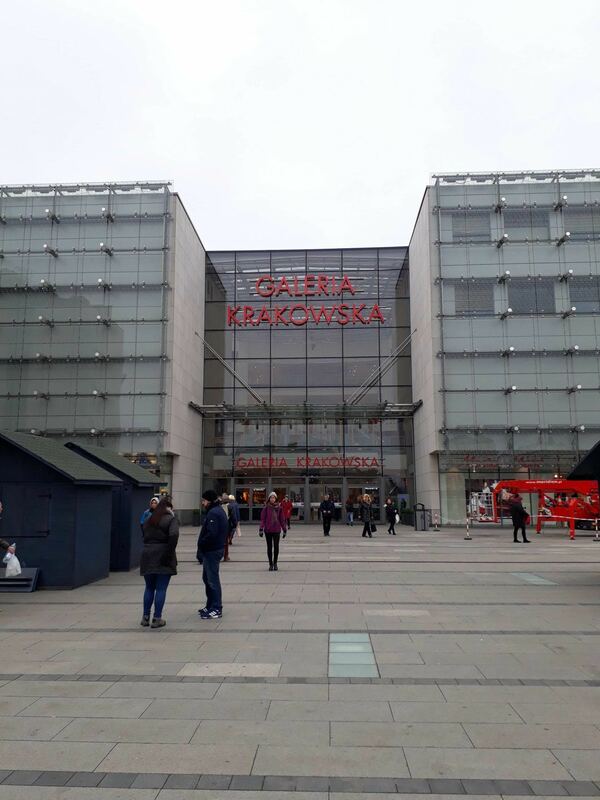 Category Archives for "Eastern Europe"
I paid for my ticket and travelled as a normal passenger. Astra Trans Carpatic didn’t know I was coming, and if they ​did, so what? I’m not a famous blogger or influencer. 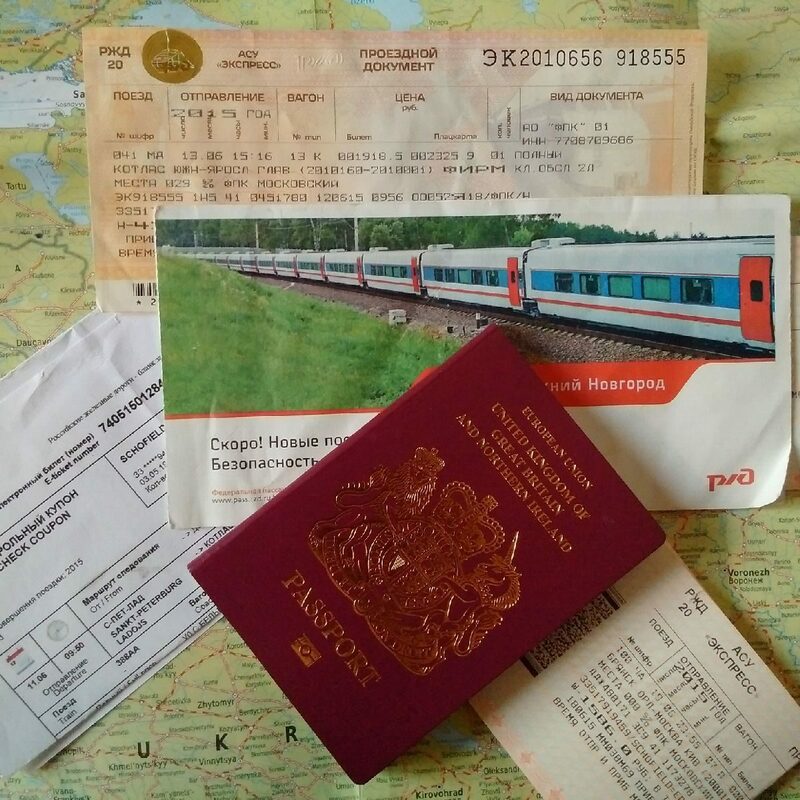 I’m just a weirdo dragging his wife and baby across Eastern Europe by train, because train bloggers don’t go by plane ever. 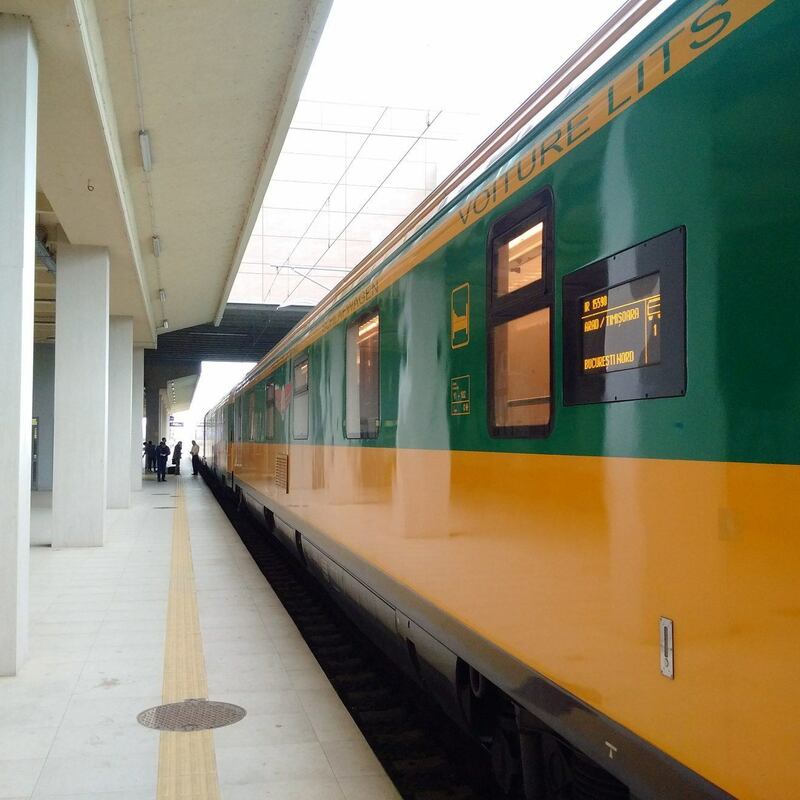 Astra Trans Carpatic is a Romanian train operator that belongs to Astra Vagoane, who make trains. 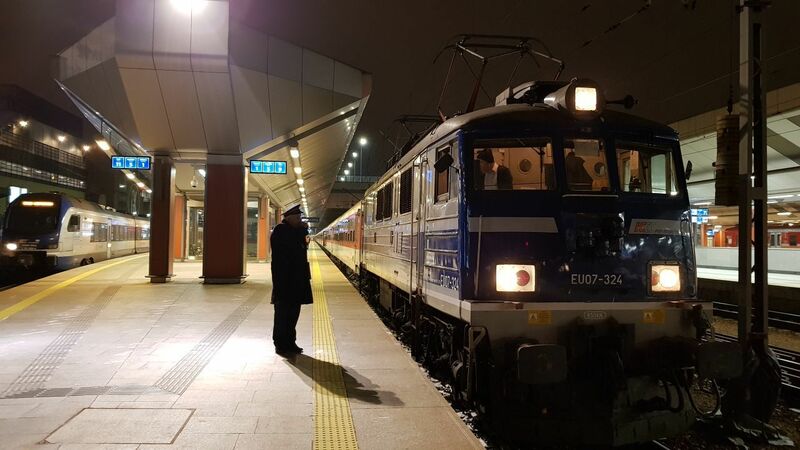 In February 2017 they started running an overnight service between Arad on Romania’s western border and Bucharest, using their own carriages. 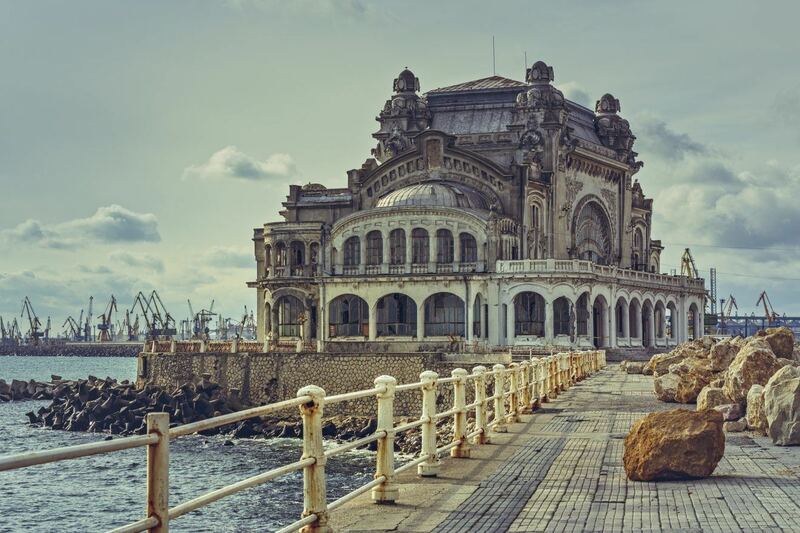 In the summer months the ​service is extended from Bucharest to the Black Sea port of ​Constanța, making it possible to traverse the whole of Romania - from the Puszta through the Carpathians to the ​shores of the Black Sea - in thirteen hours. The ​tidings of a new overnight service in Europe reached me ​between sobs in the office I had ​washed up in after Deutsche Bahn axed its ​CityNightLines and with them my ​job. After decades of night trains being ​closed down, this was a lovely bit of good news and I have ​wanted to pay Astra Trans Carpatic a visit ever since. 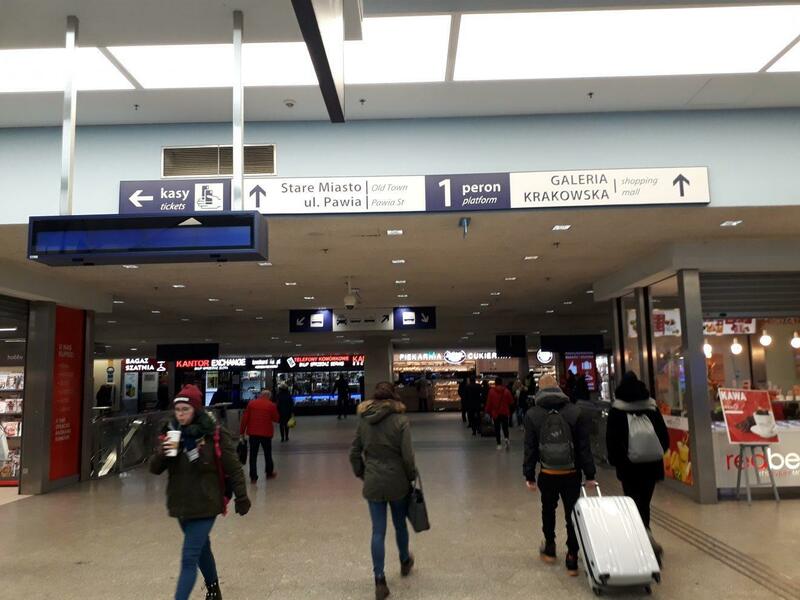 ​05:​28 is not a nice time to wake up and ​arrive at Bucharest Gara de Nord, but everything is open and you can have breakfast at McDonald's. What is wonderful is to watch the rest of Bucharest stir and come to life. But 08:35 is a very civilised time to arrive at ​Constanța. 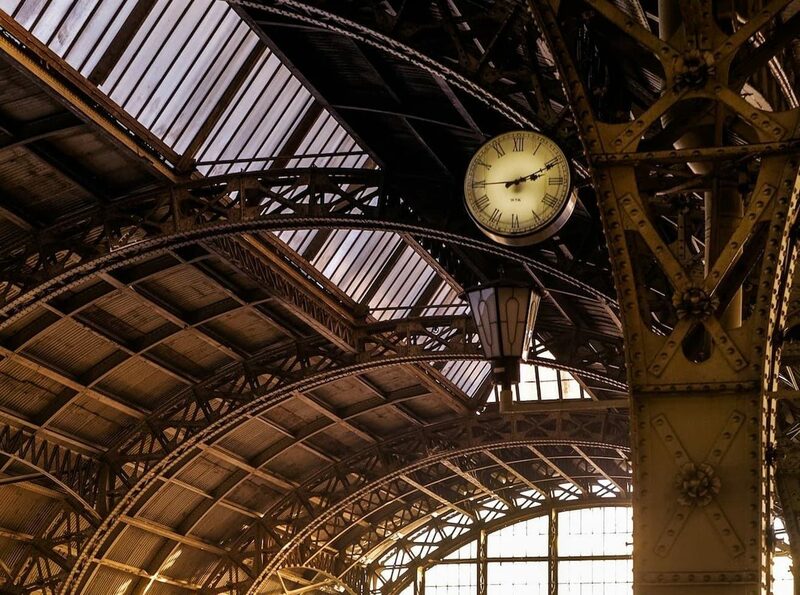 ​The westbound service has perfect timing in every way. What are the carriages like? 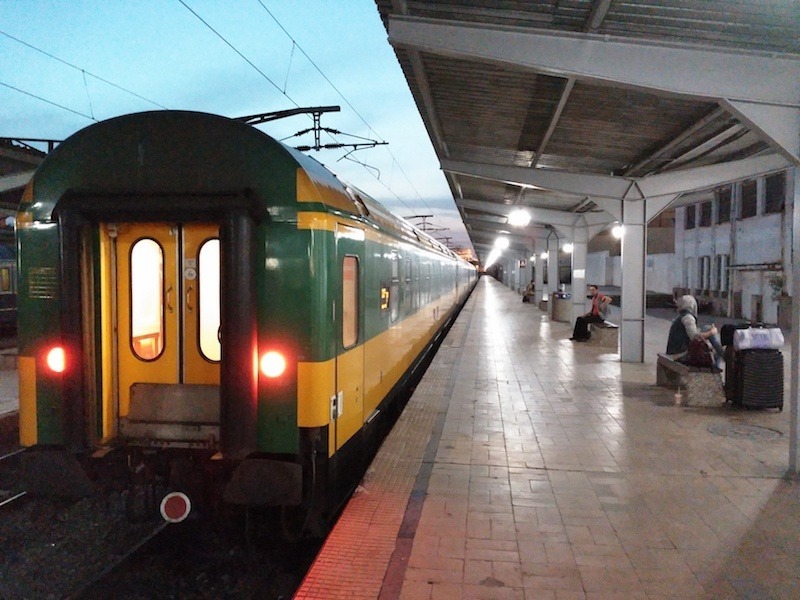 ​The carriages are built to standard European specifications (for the nerds: UIC-Z, essentially Eurofima from the 1970s and 1980s), meaning they can be used almost anywhere on the Continent - good for when Astra Trans Carpatic goes international, or if they give up and sell the coaches. They are painted in a wonderfully cheerful yellow-green livery which makes them immediately recognisable. 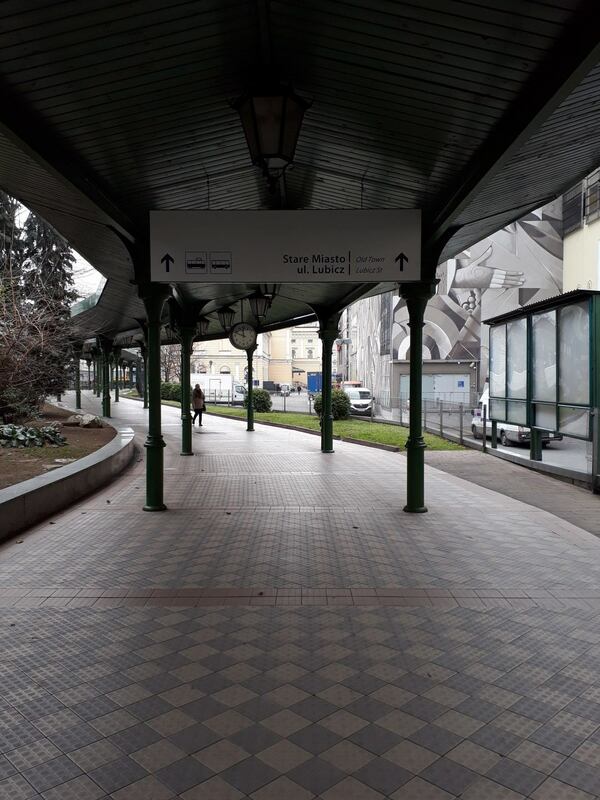 Last time I travelled overnight sitting up (from Košice to Bratislava, about seven years ago) my companions were a group of ​gypsies munching bread and sausage​ in the dark and scowling at me, followed by a friendly drunk who looked like Asterix in a communist polyester suit ​and ended up embracing and kissing me and giving me slivovitz. Also, since working on the night trains and regularly seeing what ​goes on in seated cars at night, I've come to avoid ​them. But if I had to, Astra Trans Carpatic's car is one I could imagine travelling in. 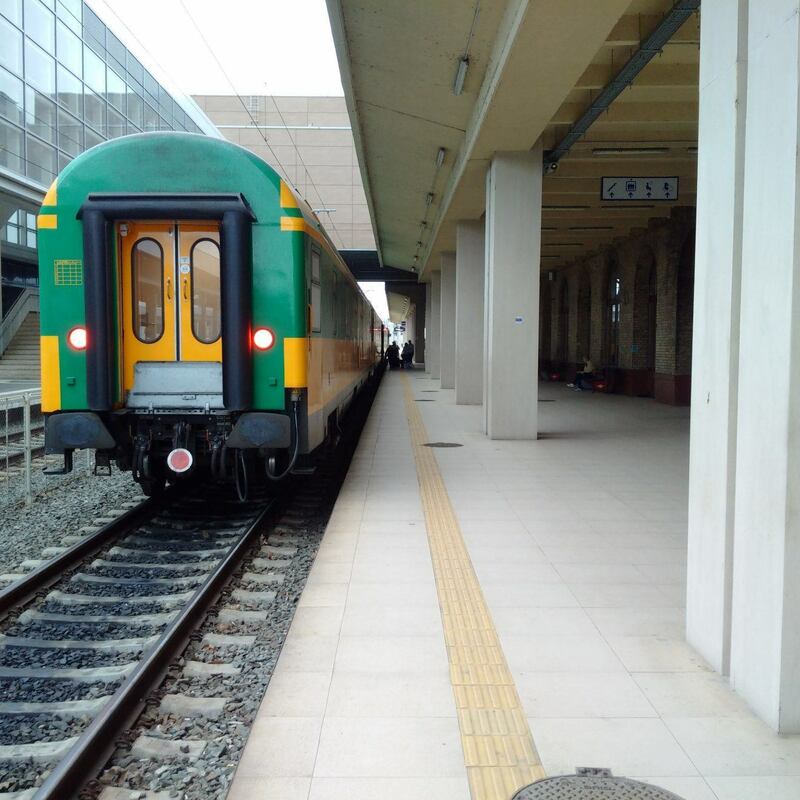 ​Astra’s 2nd class seated car is probably one of the nicest in Romania - it is ​worlds ​better than the 2nd class on the ICE or the Railjet, simply because Astra has taken the trouble to align the seats with the windows. On newer Deutsche Bahn trains you may ask for a window seat and find yourself ​staring at a wall. Carpeted floor, 2+2 seating, leather seats, functioning air conditioning, sockets for every seat - Astra has done well. Some seats are arranged in sets of four around a decently-sized table. ​Astra only does 4-berth couchettes. This is a good thing. 4-berth is much more civilised than 6-berth, better for air-quality and space to move. The bunks have proper mattresses, a big pillow and a real duvet. You make your bed yourself with linen provided. 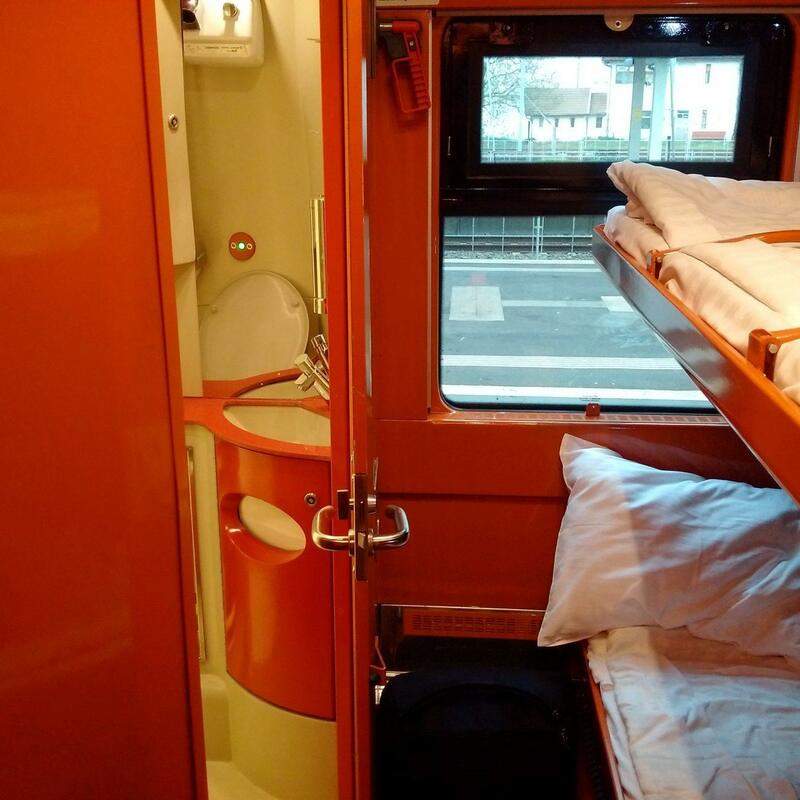 Thus, though sold as a couchette, it is more like a 4-berth sleeper. Each berth has a power outlet next to the night light. 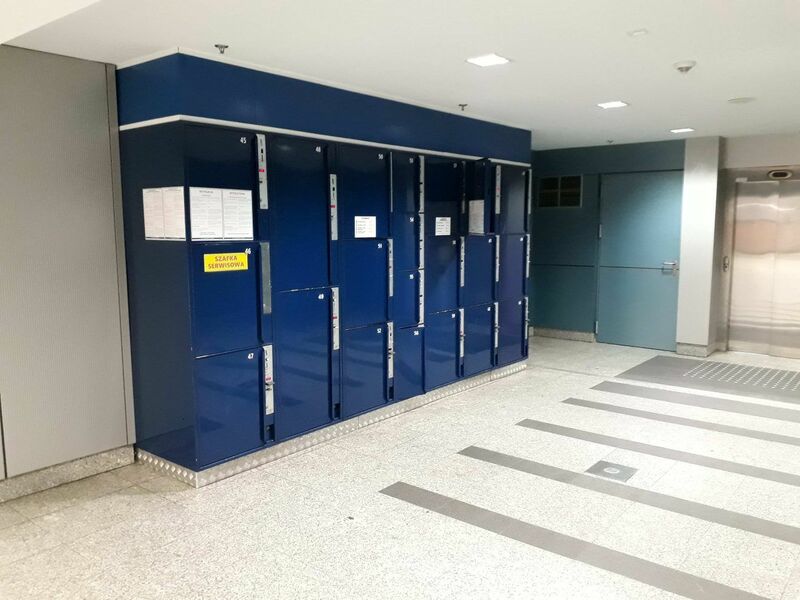 There is a shower at the end of the corridor. 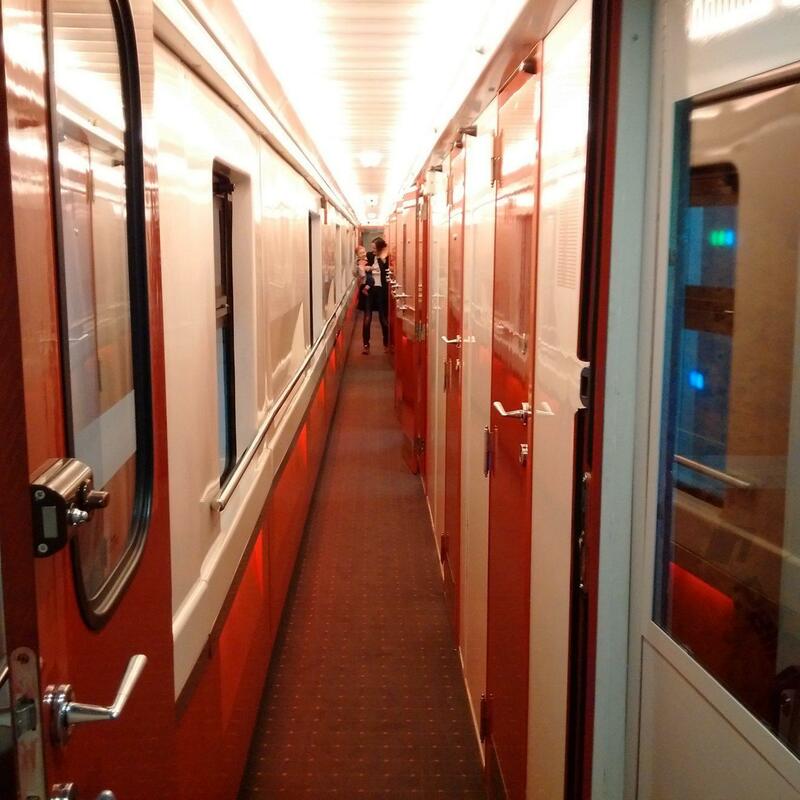 ​One of the nicest couchettes I’ve ever seen, on par with the Russian 4-berth sleeper running on the Moscow-Nice and Moscow-Paris services. ​Now for the sleepers. 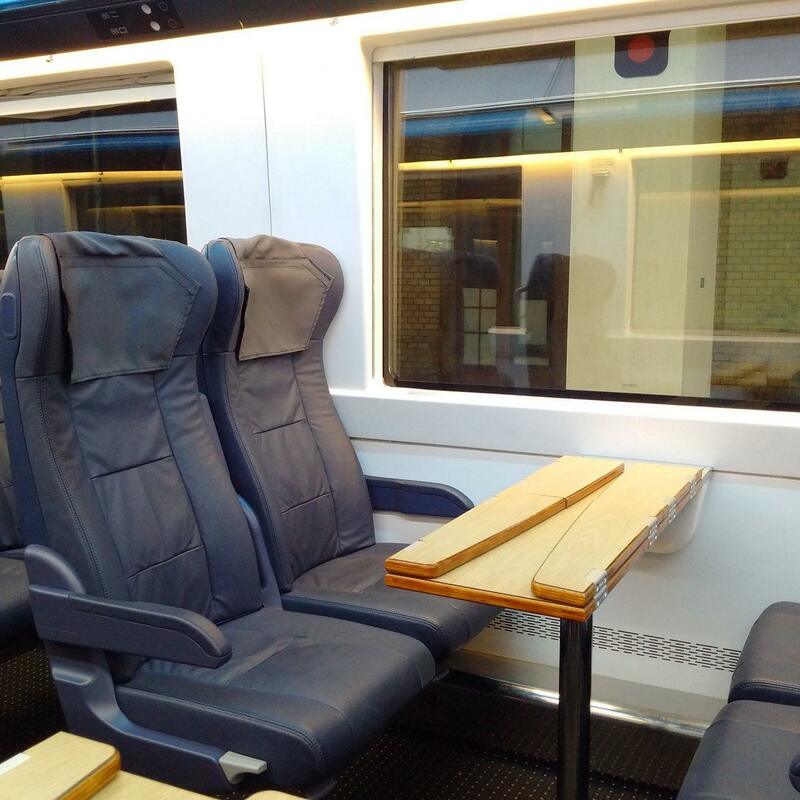 Each sleeper carriage has ten compartments with two berths each - Astra doesn’t do T3 berths. Two is the maximum amount of people in a compartment. This is much higher welfare than the CityNightLine and Nightjet Comfortline carriages that squeeze two more compartments with three berths into the same ​26.4 meters of length. ​The compartment is carpeted and the walls are clad with faux-walnut. Anything not in faux-walnut is painted a similar ochre colour. The duvets are nice and long, so your feet are covered, and the pillows are a decent size. 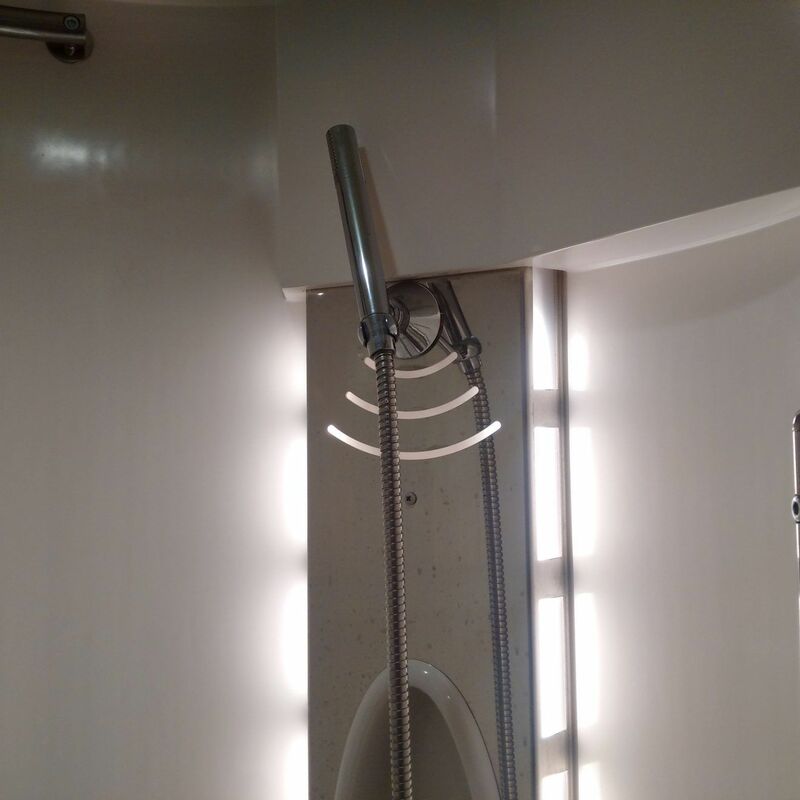 ​Three of the compartments have a futuristic en-suite bathroom with a loo, a shower and a sink. Mine was spotless. 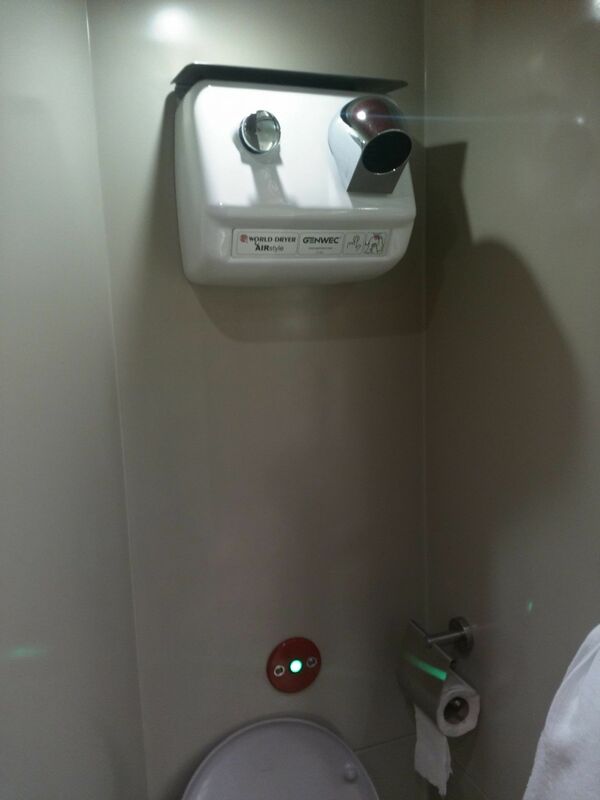 Here’s one fun Eastern European hack Astra has done: Install an upside-down handdryer as a hairdryer​. The shower was fabulous. Both hot and cold water at decent pressure, cool lighting, no funny smells. Obviously the equipment is new, but I hope they manage to ​maintain this standard. ​What I particularly like is the lighting. There is an array of switches over the door that controls them. Next to your pillow there are also light switches. If you turn all the lights off you have true darkness, which is great - in most sleepers you are still left with some sort of LED shining in your face. The Nightjet sleeper has a little white button I feel compelled to cover, and PKP's new and refurbished sleepers have an appalling blue LED blaring all night. 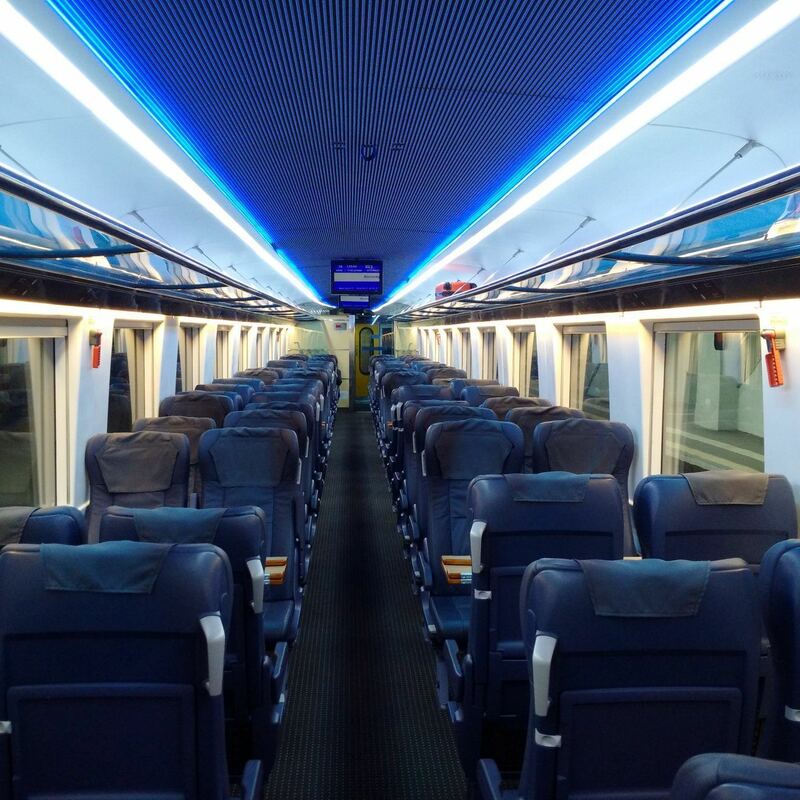 ​Having described the train itself, we shall now have a look at the service concept on Astra Trans Carpatic. ​After the train sets off the attendant knocks and wants to see your ticket. In my case it was a QR code on my smartphone. 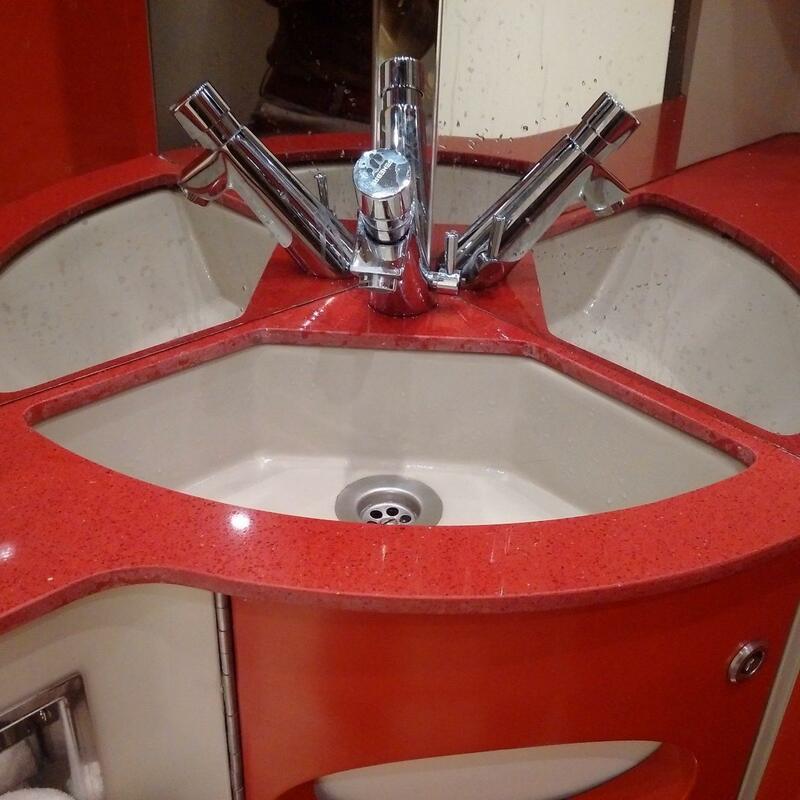 All the attendant did was look at it cursorily. 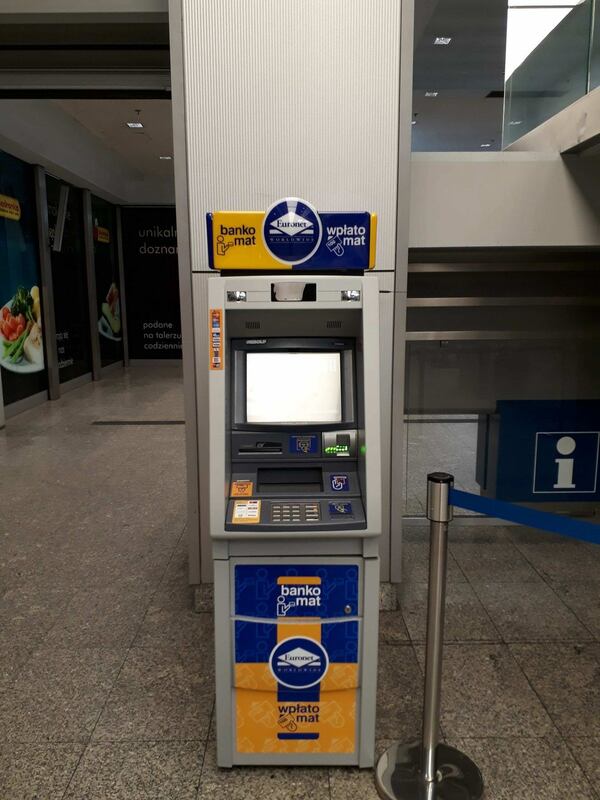 No scanning, nothing. 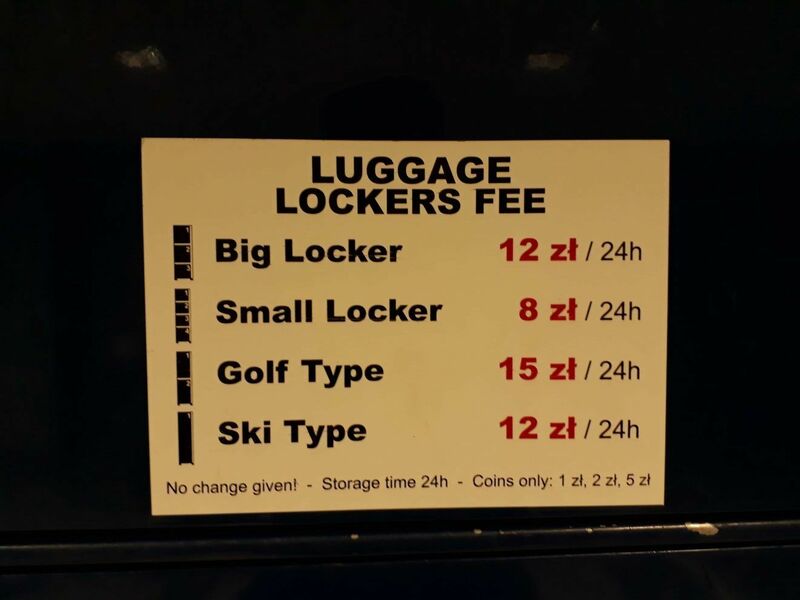 Of course, if you are in your compartment and no one else lays claim to it, and they have you on their list, there is no reason to go scanning QRs or looking at ID cards. One thing I missed on both my trips was complementary water. I think a bottle of water should definitely be included in the price of one's berth. ​In the morning ​they wake you with a knock on the door. 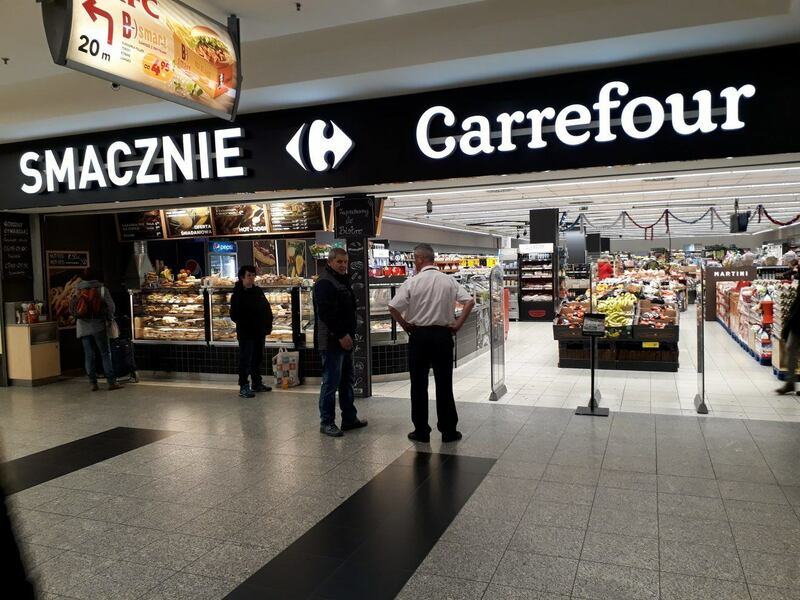 On my arrival in Bucharest there was no breakfast - maybe because it was impossibly early (05:28 AM) or maybe because the attendant had forgotten. 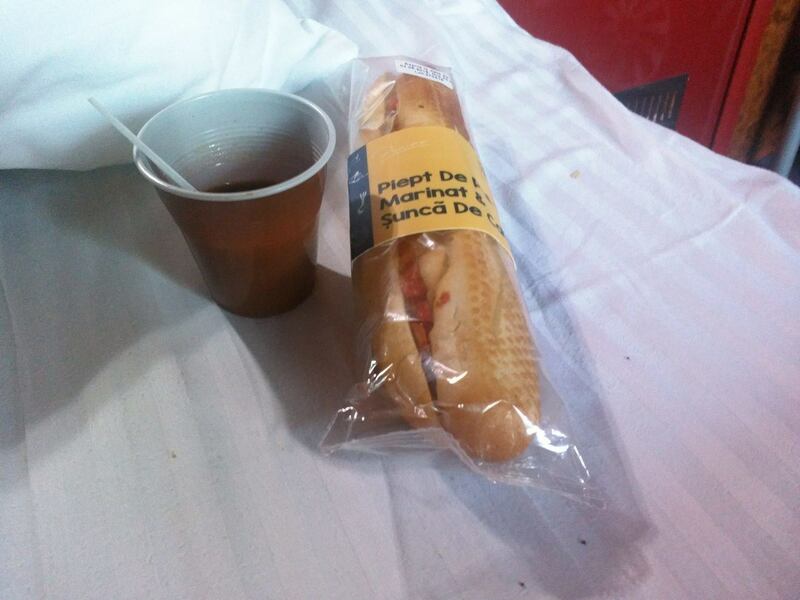 On my arrival at Arad, on my return journey, there was ​weapons-grade instant coffee and a plastic-wrapped submarine sandwich with chicken and red pepper in it. I don't know what it tasted like. ​As ​a sleeping car attendant who has made thousands of night train breakfasts and thrown away almost as many, I think breakfasts are a waste of workers' time, the punters' money and precious food. What people need is a hot drink and a small, energising snack to ​keep the wolf from the door as they drag themselves home or to the next bar. 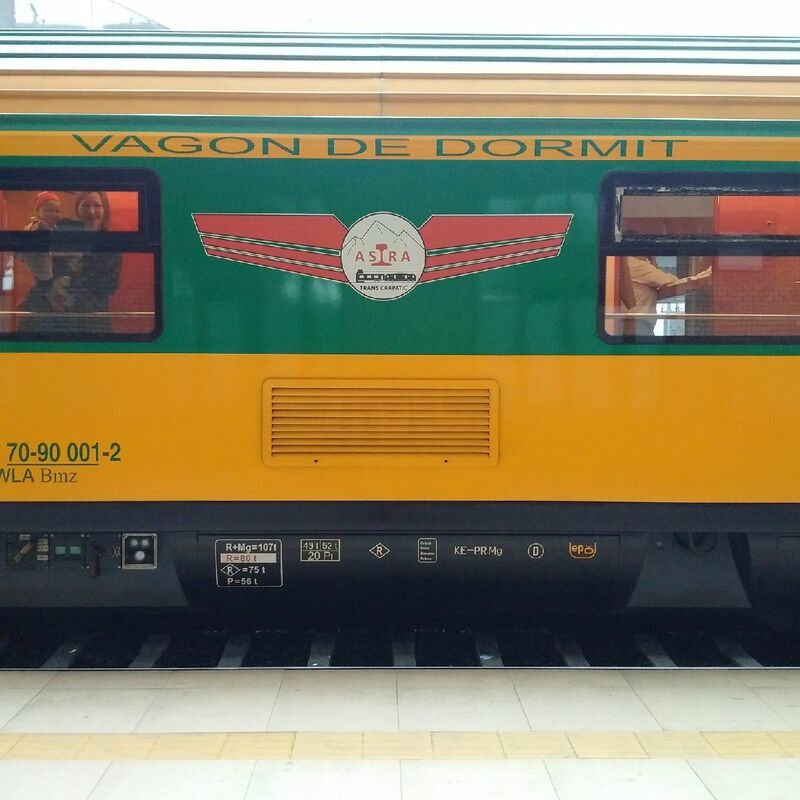 ​Wagon Slovakia, who do the night trains in Slovakia, get it right with their cup of coffee and waffle bar. 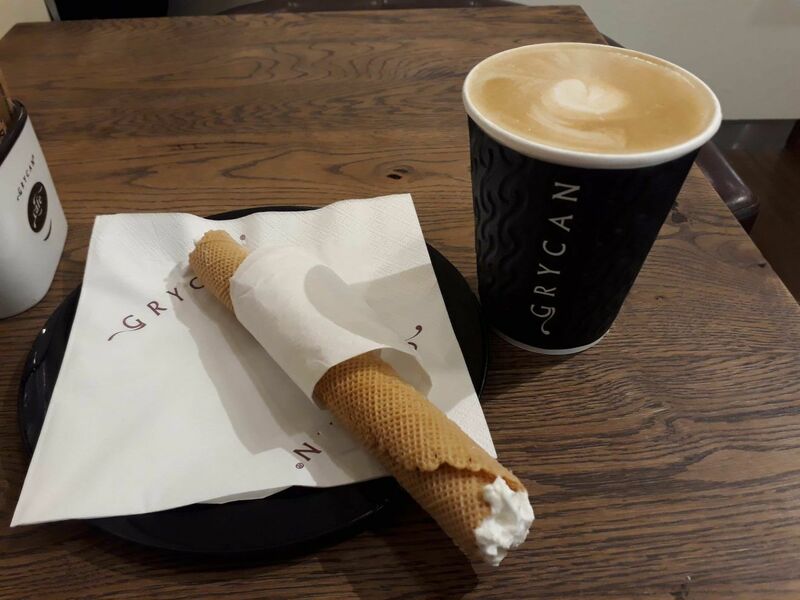 No fuss, you drink your coffee lying down and eat or don't eat your waffle bar, or you take it with you for later. 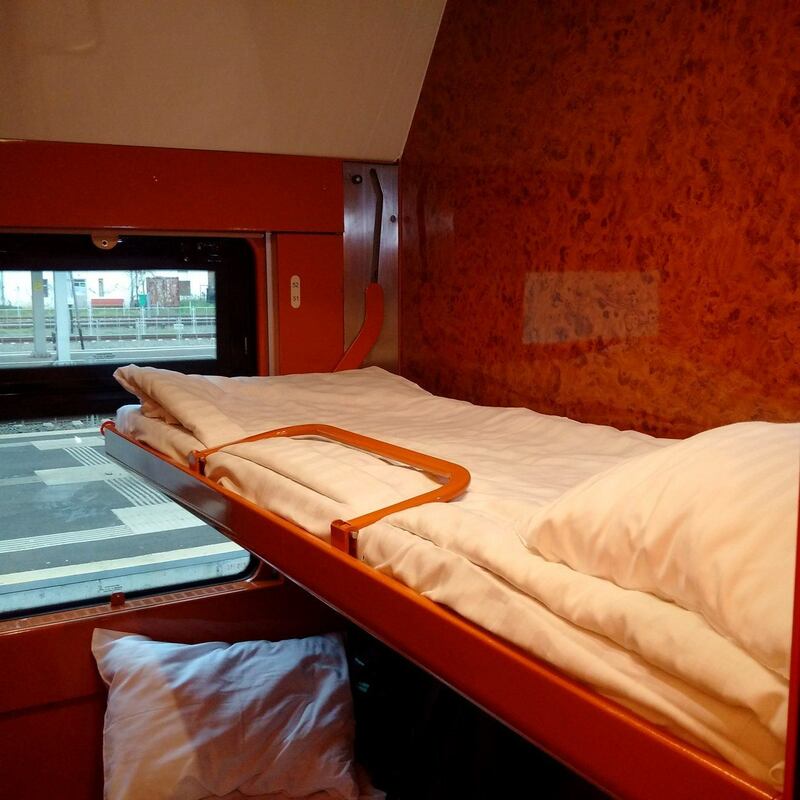 ​Sleeping car people can afford not only to go in the sleeping car. They can also afford food allergies and paleo diets. Then there are vegans. There is no lowest common food denominator a rail company can fall back to, so it is better to keep breakfast as low-key as possible. The Russians don't do it at all. 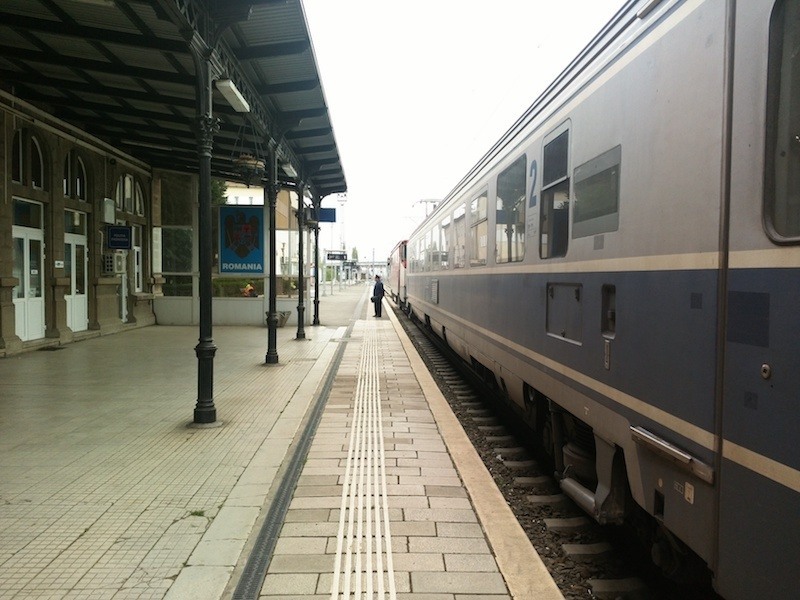 ​The train is not long - only four carriages - and so it doesn’t have the length to support a restaurant car, sadly. There is a minibar with all the usual stuff on sale - "drinks and light refreshments" is the technical term, I believe. I'd brought my own, so I didn't use it. Once I tried to get water, but couldn't chase down the attendant and lost interest. ​As a blogger in the service of my readers I am prepared to go to extraordinary lengths. One of these lengths is to forget ​a mobile phone, a neck cushion and a baby’s favourite blanket on the train. A shunter found me wandering around the sidings of Arad station. I explained in my ​best Romanian that I had lost my phone. He made some phone calls and asked my to wait by the ​casa de bilete. 3. It was easy to book online. ​5. 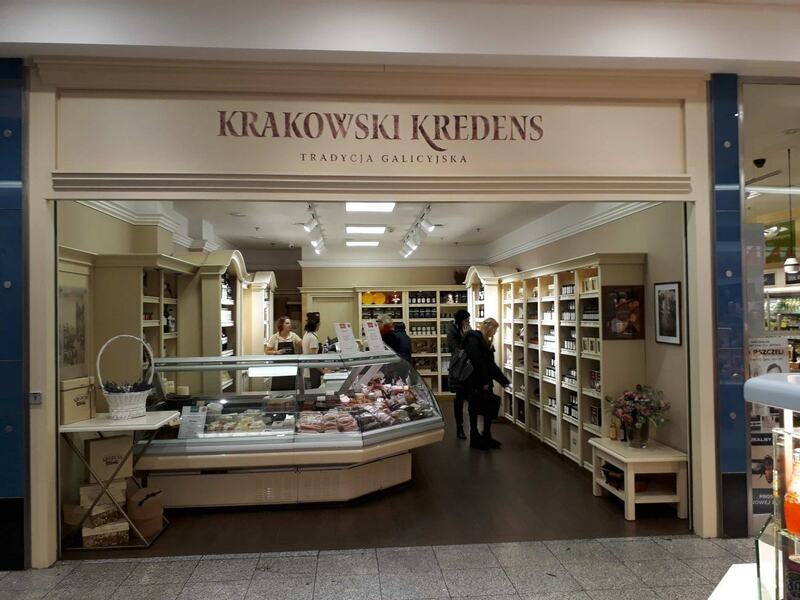 As mentioned above, it gets you all the way from the Puszta to the Black Sea without changing. 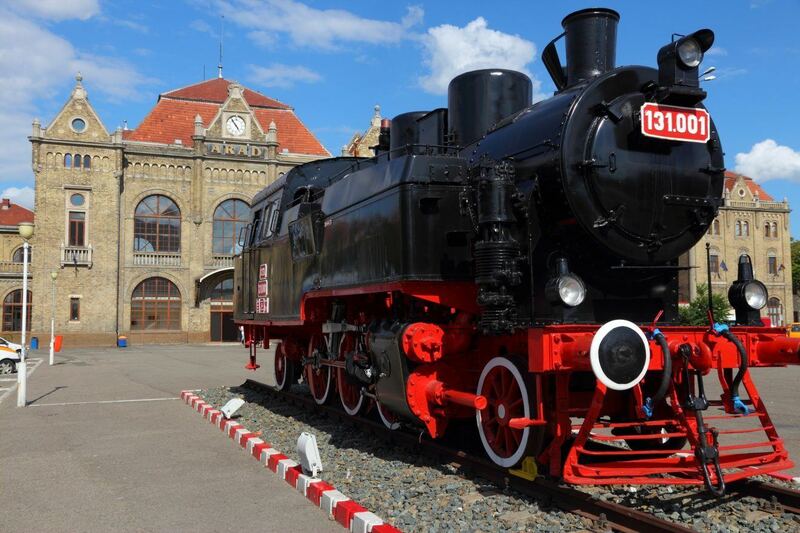 Get on at Arad at 19:08, arrive Constanța at 08:35 the next morning. 2. 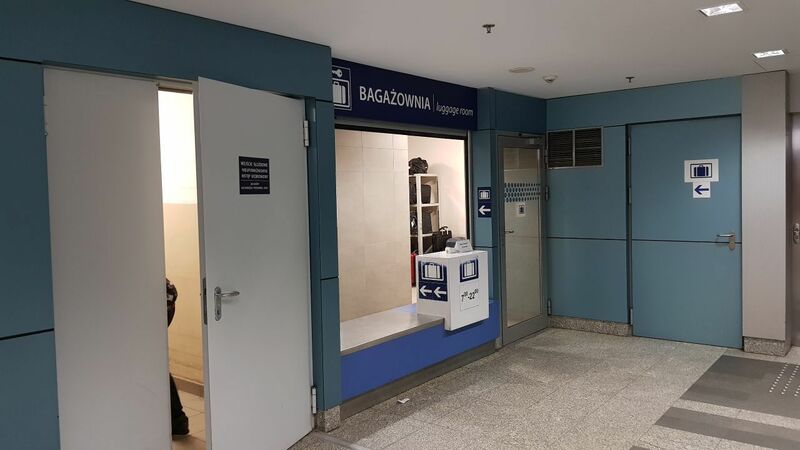 You then spend four hours waiting at Arad. However, I found time passed quickly. Lunch, a walk along the river and a small shop. 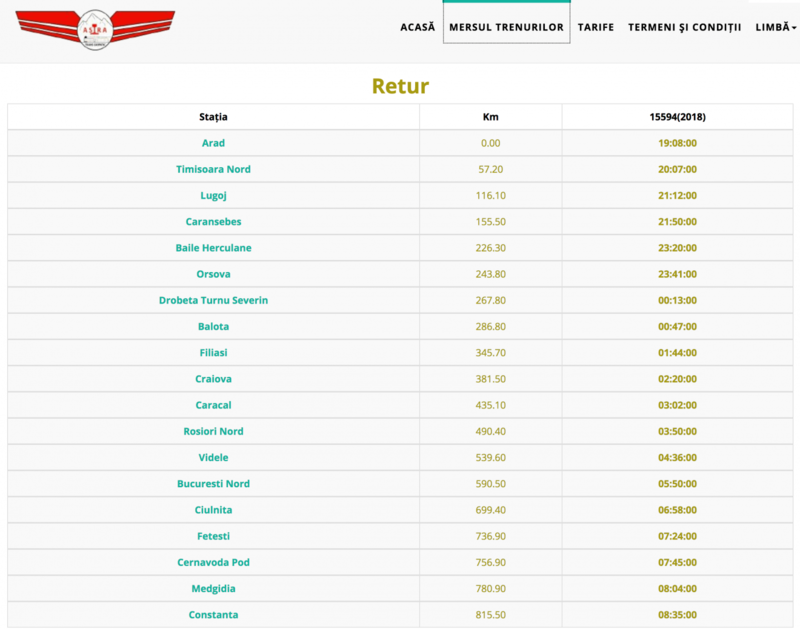 People who like trams: Arad has ​second-hand trams from all over Europe ​plying its huge tram network. It's like a tram zoo out there. Also, the time is well spent getting acclimatised to Romania, Romanian and Romania's plastic ​bank notes. 3. 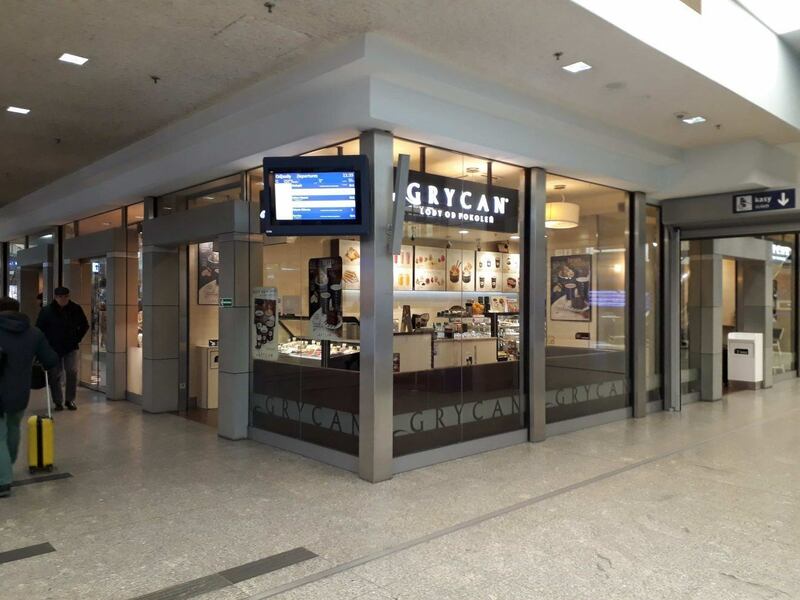 You can't use Interrail or Eurail on Astra Trans Carpatic, or indeed any long distance international train tickets. 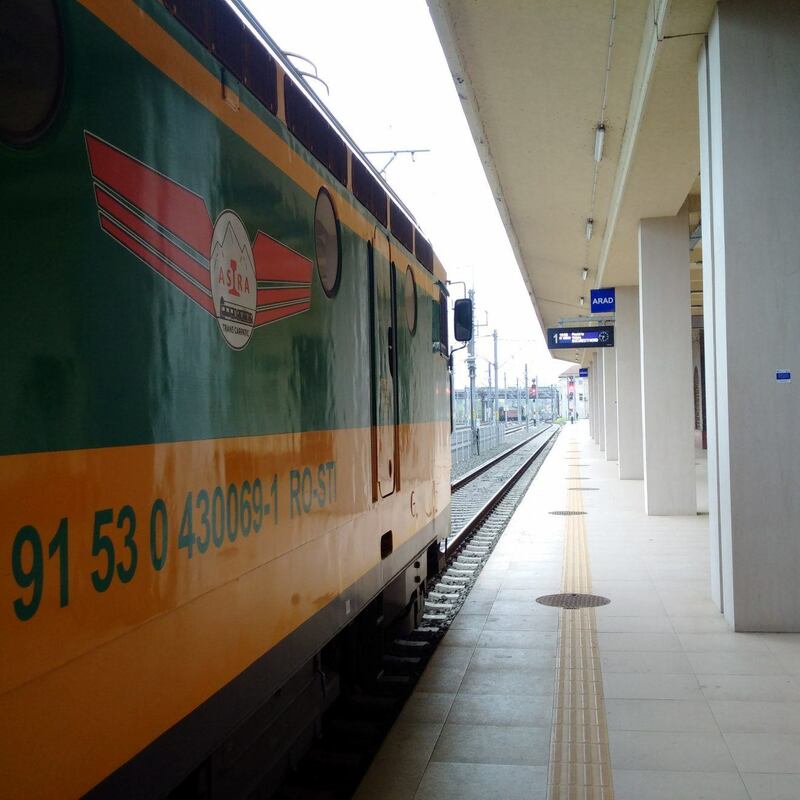 ​Going east towards Bucharest, you'll want to join the Astra Trans Carpatic either at Arad, like I did, or at ​​Timișoara, the next station up the line. 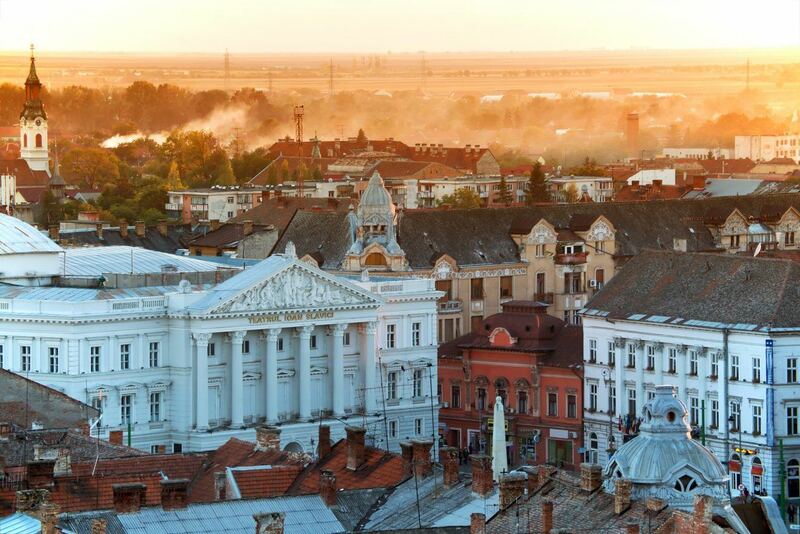 ​​Timișoara is a bigger town with more ​for ​the tourist to see. 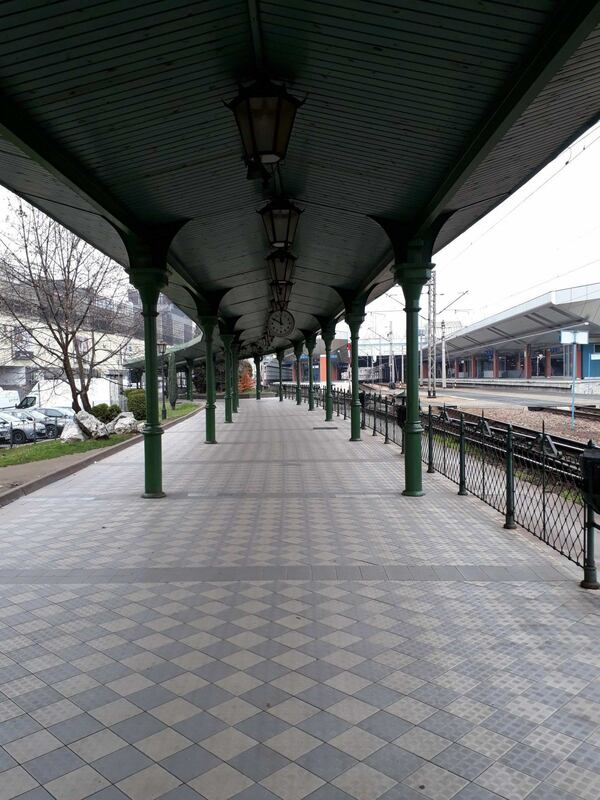 There are no more trains from Belgrade to ​​Timișoara, so one must always come from Hungary. 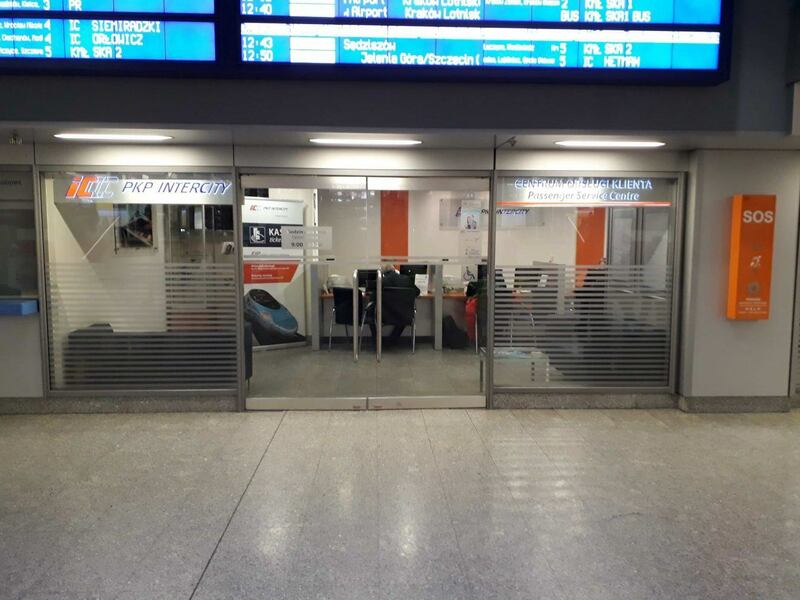 I have played around with the timetables and always end up with the IC 75 ​Transsylvania​ that leaves Budapest at 09:10 and Szolnok at 10:32.​ ​​​It reaches Arad at 14:34, and if you want to wait at ​​Timișoara you change here onto the 14:44 R 2606 for ​​Timișoara. Wherever you decide to wait, it will be four hours. 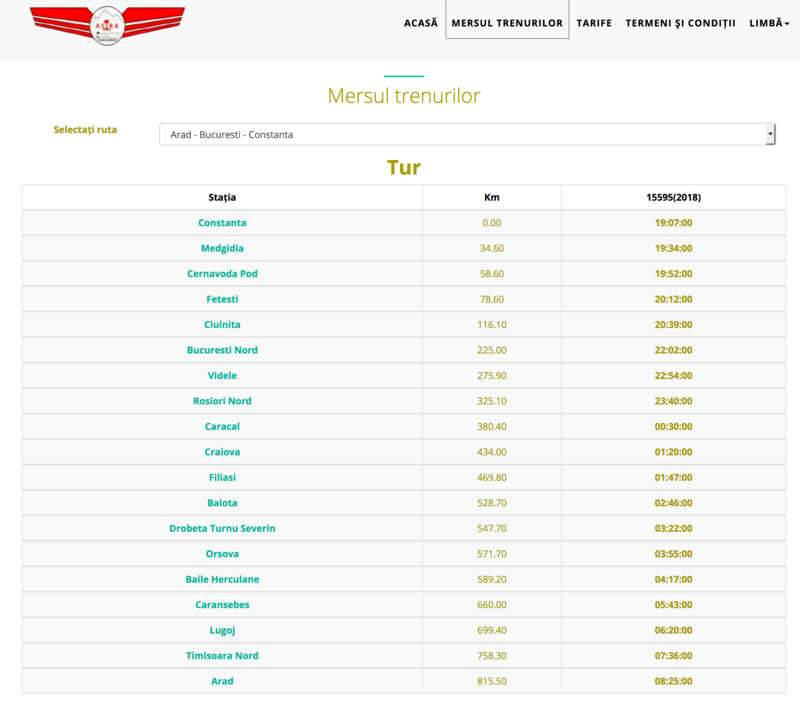 When you reach Bucharest the next morning at 05:28, you can get any number of onward trains​. 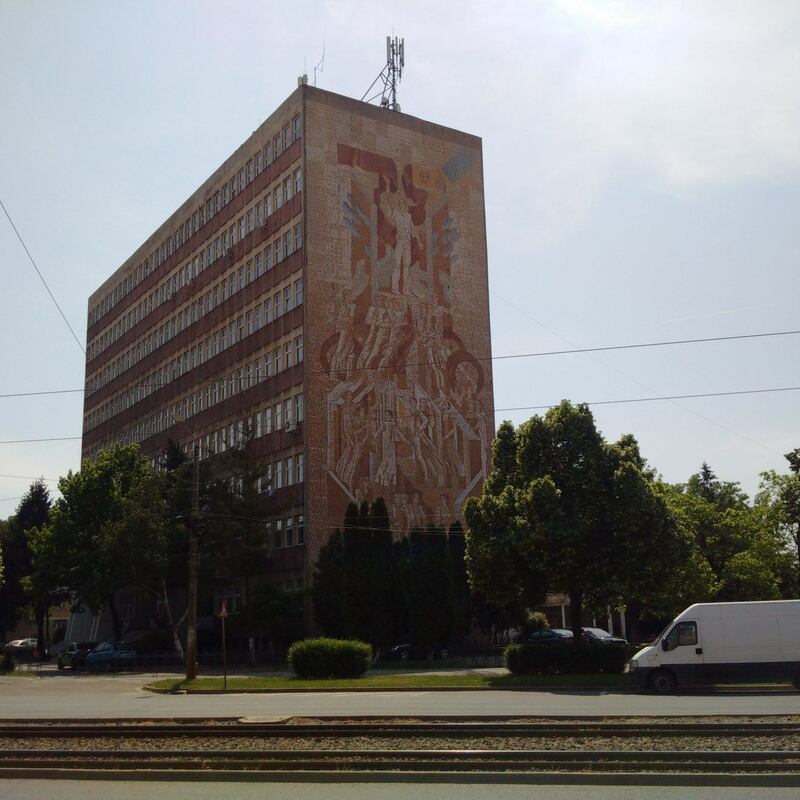 Outside Arad station is this building belonging to Astra Vagoane with a communist mosaic on it, celebrating Romanian-Soviet friendship - these are rare in Romania, due to ​​Conducător Nicolae Ceau​șescu's fitful relationship with the USSR. 2. 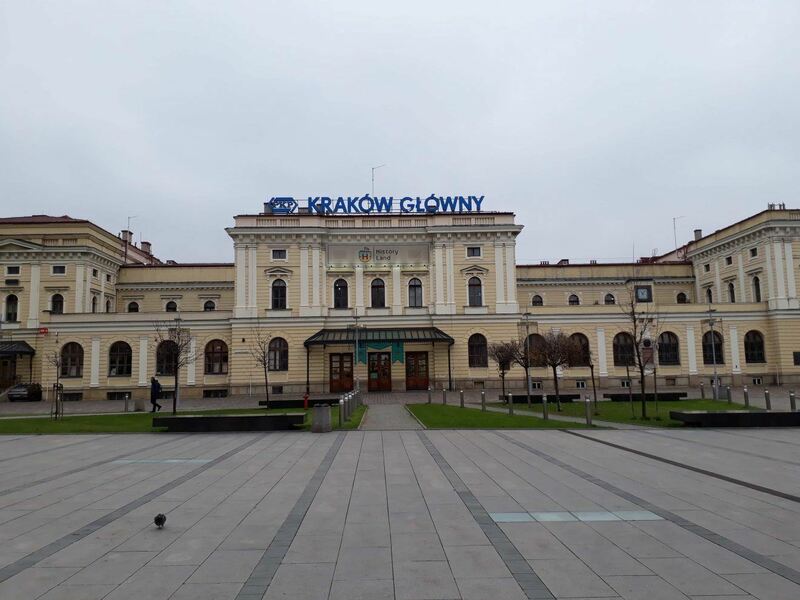 Get off at 08:25 at Arad and get the IC 74 ​Transsylvania ​from Arad at 14:20​​​. 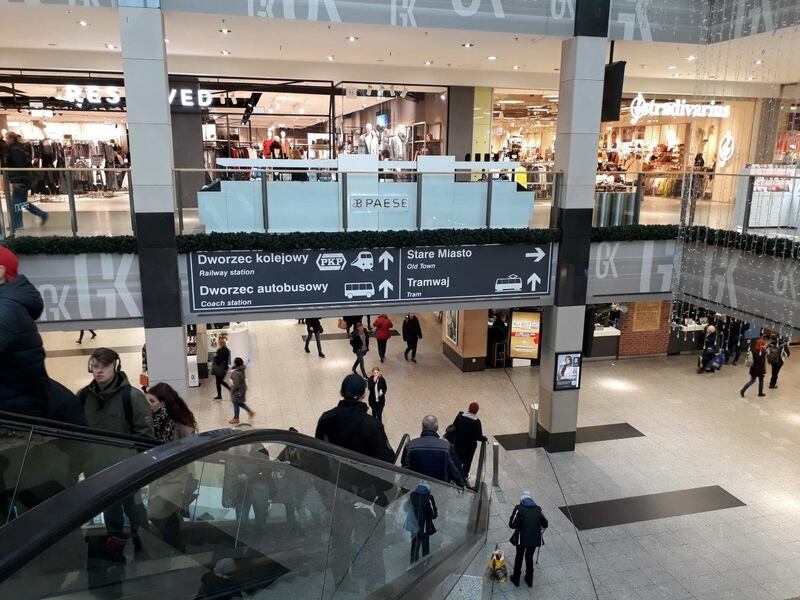 ​There is a posh shopping centre next to Arad station in which ​you can hole up in a ​café, or ​​​you can go into town. ​Yeah, great, but where do I get my tickets from? 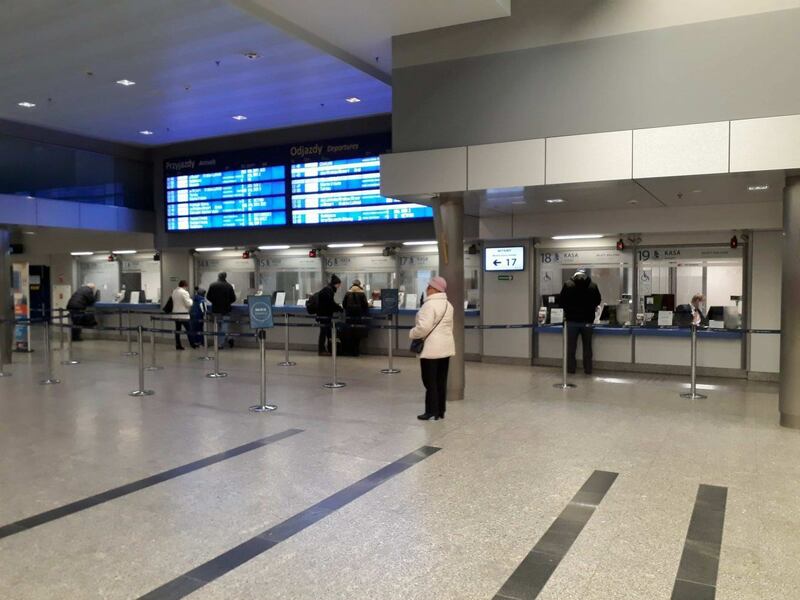 At Arad and at Bucharest Gara de Nord Astra Trans Carpatic has its own ticket offices (casa de bilete). 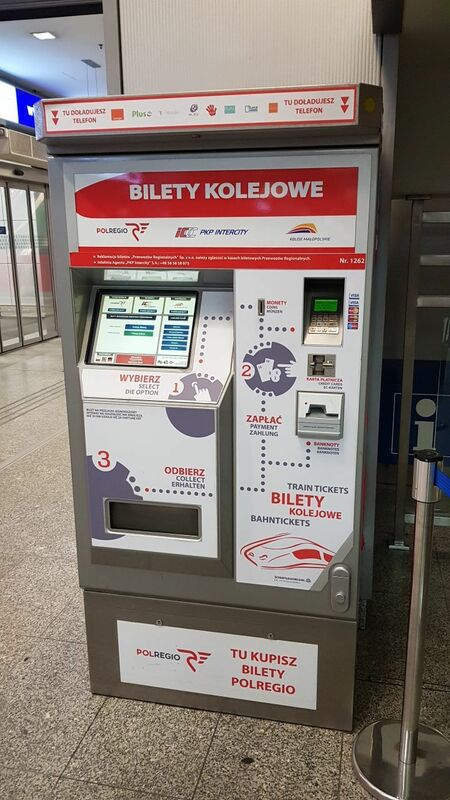 You can also just buy your ticket on the train with no surcharge. I got my tickets online in advance. Unfortunately the ticket buying section is in Romanian only. Fortunately Romanian is one of the easier languages ​for winging it, especially if you know some French and Italian. Also, if you use the Google Chrome browser, you can have it translate everything quite accurately. If you need help getting Astra Trans Carpatic tickets online​ subscribe to my blog to reach me by email or on Telegram, then I can talk you through it. How much do​es it cost? Astra Trans Carpatic has a very simple pricing system. 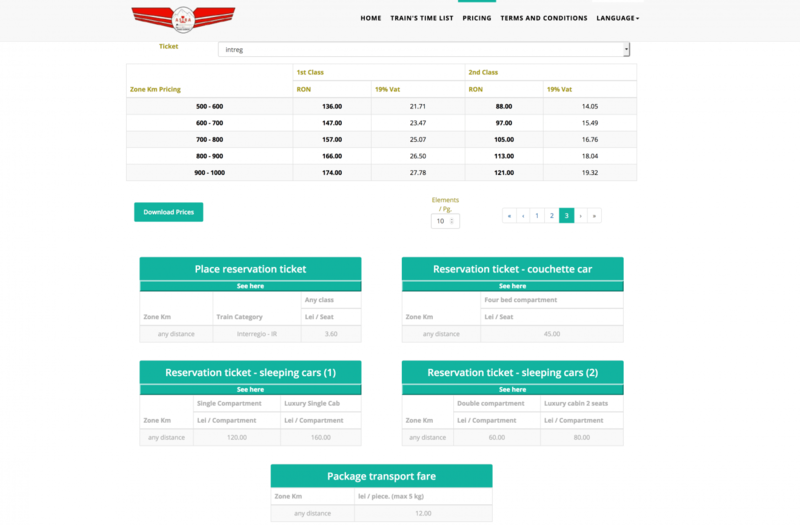 Your fare consists of kilometers travelled plus the class of accomodation you want. Tickets always cost the same whenever you buy them. 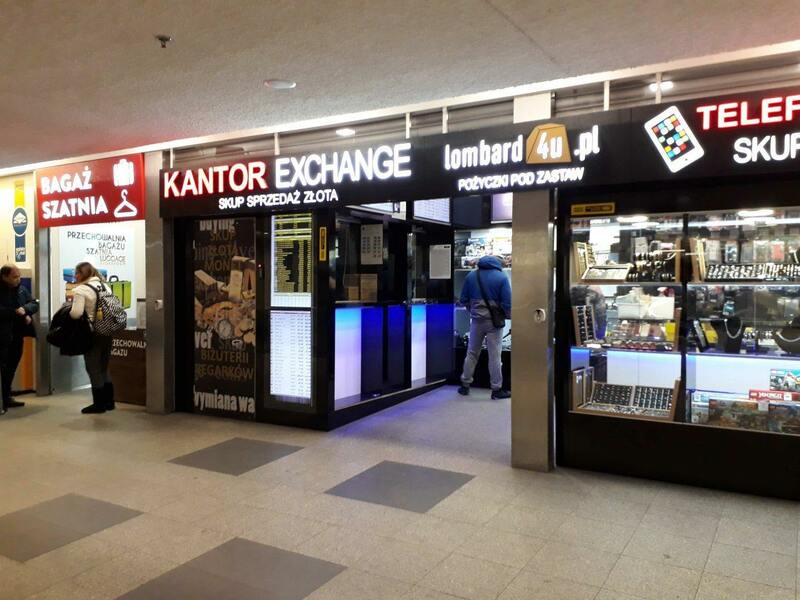 Pricing is in the Romanian currency, the leu (RON), which at the time of writing (July 2018) exchanges at €1 = 4.66 RON, £1 = 5.27 RON and $1 = 3.96 RON. 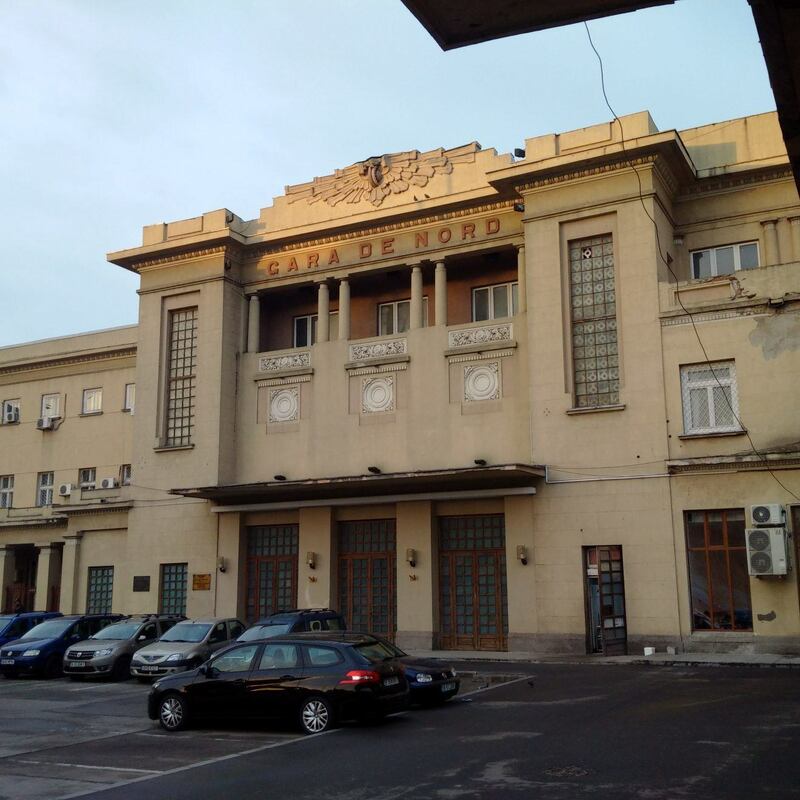 Thus Arad-Bucharest in a seat or couchette is 600km second class (88 lei / €18) plus 3.60 lei (​80 cents) for a seat or 45 lei (€10) for a couchette - so altogether €19 sitting up or €28 lying down in a couchette, all the way from Arad to Bucharest. 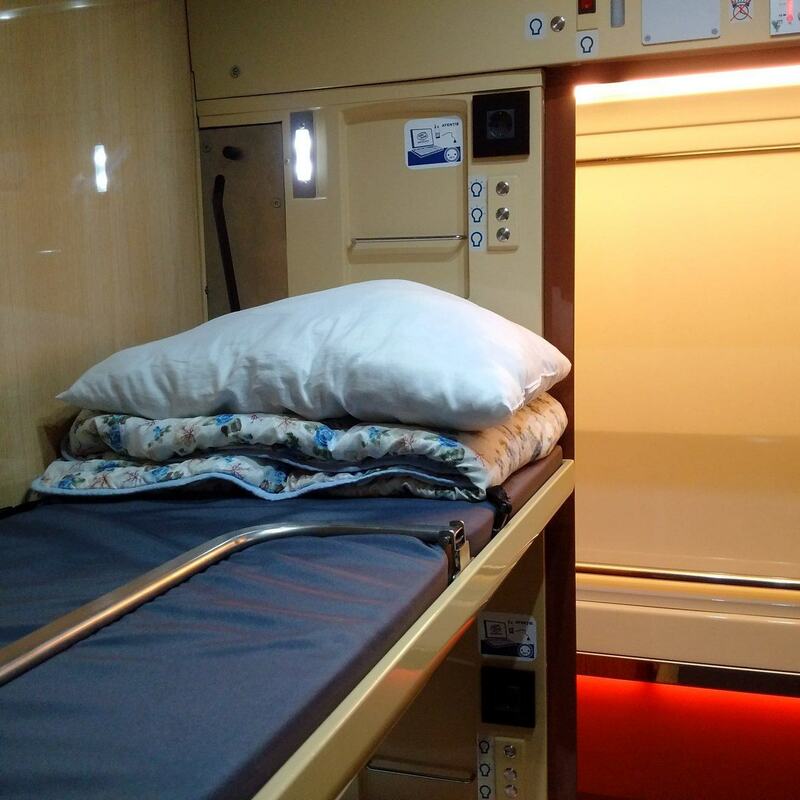 In a sleeper its is 600 km first class​ plus the ​supplement for a double or single sleeper or a double or single sleeper deluxe (with the en-suite bathroom)​​​. 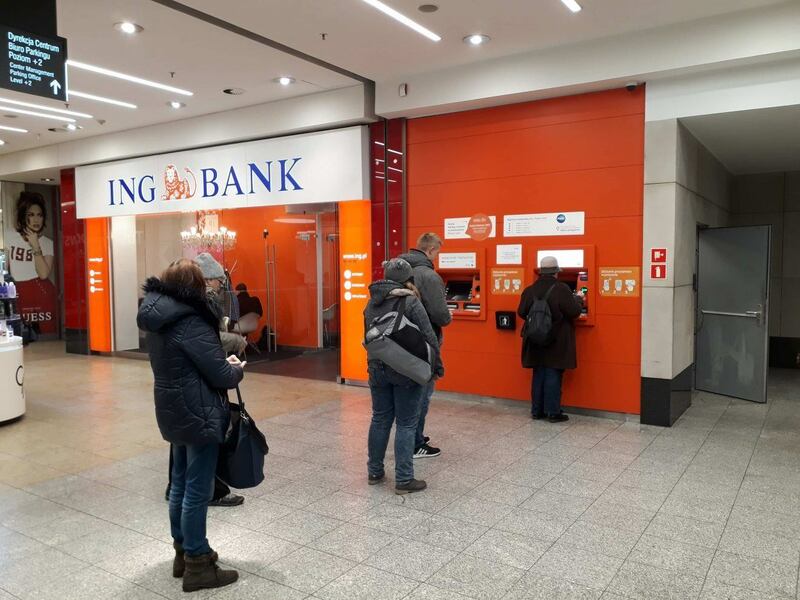 That is 136 lei (€29) for the distance plus 60 lei (€12) for a double, 80 lei (€17) for a double deluxe, 120 lei (€24) for a single or 160 lei (€34) for a single deluxe. I paid 432 lei (€92) for the double deluxe for my wife and me. The baby went free of charge. I think that is a fantastic deal. My wife said it was the best train she had ever been on. ​So what's the ride like? ​It was great. The train goes quite slowly, first across the plains to ​Timișoara, then up into the South Carpathian mountains and through Wallachia. 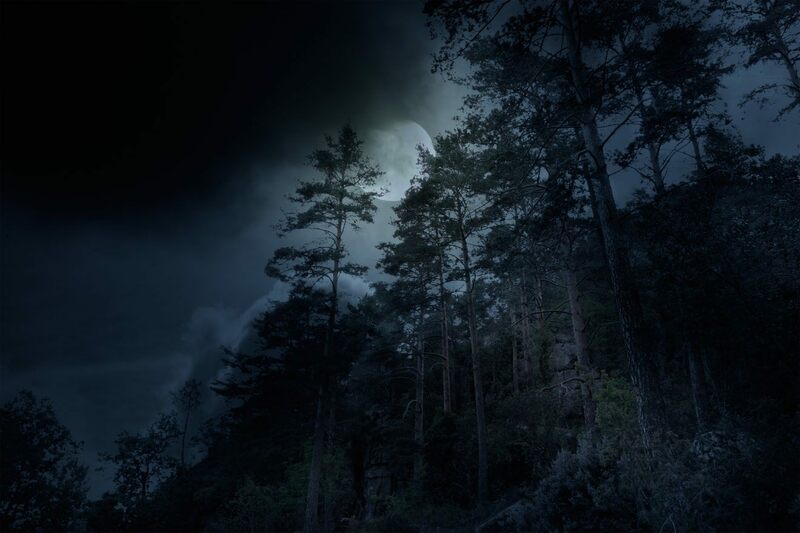 I didn't see much, to be honest, as it was dark and I slept. But ​at times I awoke and peered out the window ​into nameless ​ravines clanking underneath bridges we were ​crossing, before drifting off again to the clatter of the wheels. The attendant had switched off the air conditioning for the night, so I opened the window and in rushed lush Carpathian air. Much of Romania's tracks are still screwed rather than welded together, so you spend ​much of the journey immersed in this hypnoti​c ​haze of metallic rumbling that is great for sleeping. 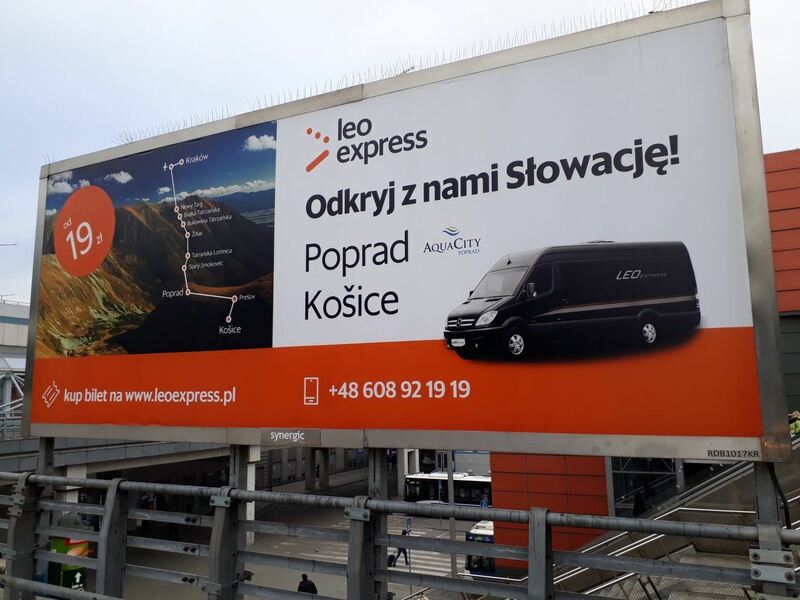 ​Astra Trans Carpatic have done something brave in starting up a night train service in this age of budget airlines and ​coaches. The European Union is still very much in love with planes, global warming be damned. That is why it is so fantastic that there are people setting out to make money with trains, and indeed overnight trains. Astra Trans Carpatic have a service that is very nice, reasonably priced and well thought out. 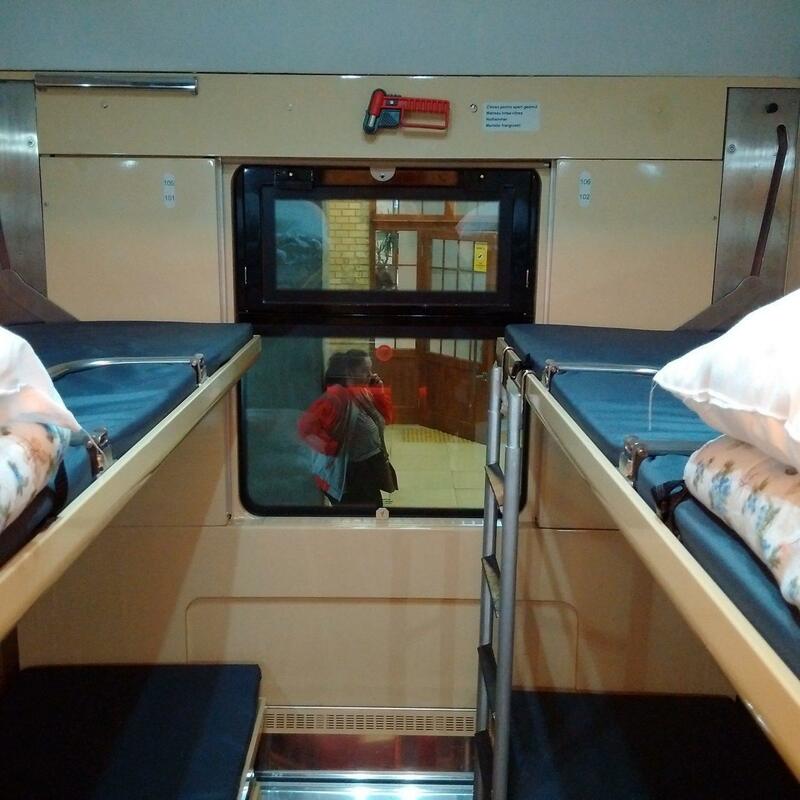 I ​love their higher-welfare couchettes and sleepers with only four and two berths respectively. 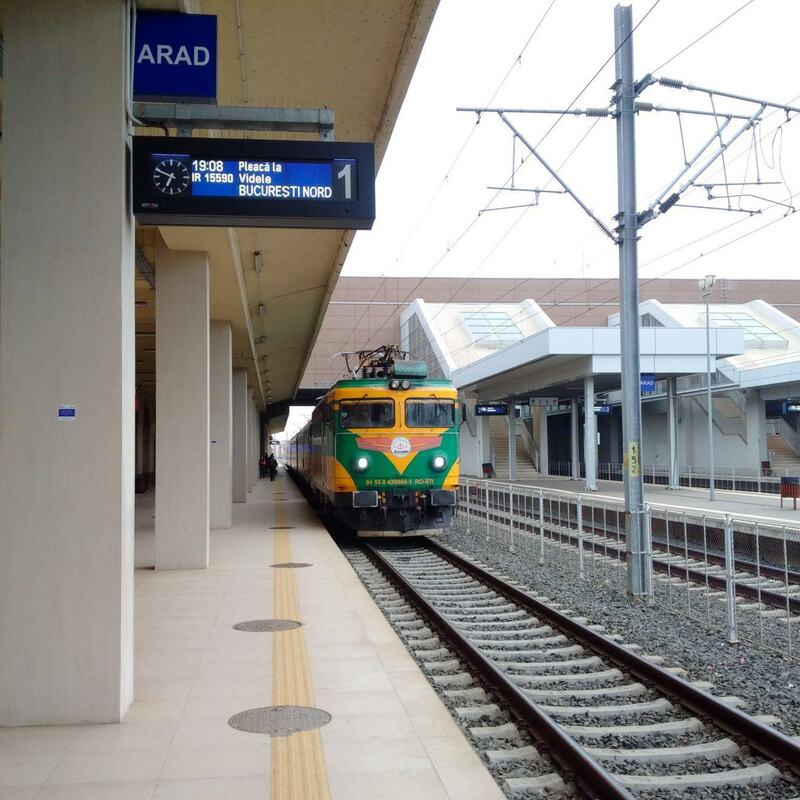 People on their way to Romania from abroad are more likely to use the established Euronights simply because they are more convenient, but those who make the effort to get to Arad are rewarded with a great train service.